Authorities removed 44.8 tons of banned goods from stores in the first half of 2015 and are destroying sanctioned products seized at the border. In the past two years, the Russian government has introduced sanctions against a number of countries, including the U.S., Australia, the EU member states, and now Turkey. Why is Moscow restricting imports and how is this embargo affecting Russia itself? In August 2014, Russia introduced sanctions for the first time in modern history, responding to measures against Moscow undertaken by certain countries because of its role in the Ukrainian crisis. The EU and the U.S. took action first by forbidding an entire group of politicians and entrepreneurs considered close friends of Russian President Vladimir Putin from entering their territories, as well as freezing their assets. In response, the Russian government prohibited the import of U.S. and EU food products, a significant blow: Before the ban, the share of import products on the retail market was 40 percent. At the end of November, after the Turkish air force shot down a Russian bomber, the Russian government retaliated with sanctions against Turkey. Imports of practically all food products from Turkey – except fish, nuts and milk – are banned. The next country to be hit with Russian sanctions may be Ukraine, in the event that it signs an economic association agreement with the EU preventing the re-export to Russia of prohibited products from European countries. If Ukraine does sign the agreement, according to the Russian government, the import of food products from Ukraine may be prohibited after Jan. 1. Why is Russia restricting imports? The Russian government is restricting imports because in recent years, the country has been exporting substantially more than it has been importing, say Russian analysts. Further, a significant share of Russian exports is made up of oil and gas. For example, the commodity turnover between Russia and Turkey in 2015 is expected to be between $23-25 billion. Of that amount, about $20 billion will consist of Russian exports, while imports will be worth only $4-5 billion. “Russian sanctions concern only import, since this way in the short term they improve the country’s trade and payment balance,” said Finam financial analyst Timur Nigmatullin. In his words, the balance of trade has a particular influence on GDP. The choice of sanctions is also related to the structure of Russia’s external trade, noted Nigmatullin: The country does not export any type of unique products that other countries heavily depend on. For example, the EU and U.S. sanctions primarily concern the export of technology and financial services. As a result of the ban on food imports, agricultural production grew, but so did food prices (which the devalued ruble also affected). According to the Federal Customs Service, in 2014 the import of animal products in Russia decreased by 42 percent, milk products by 33 percent, and meat and its byproducts by 32 percent. At the end of 2014, according to the Rosstat Federal Statistics Service, prices on food products in Russia increased by 16.7 percent. The general prosecutor’s office studied the reasons for the growth of food prices in the largest retail networks and accused several of them of manipulating the market. In Moscow alone, 418 administrative proceedings were launched. As a result, the networks introduced a temporary 20 percent price freeze on goods designated socially important. What about sanctioned products that cross the border? On many occasions, the Russian government has accused food suppliers from the EU of bypassing the sanctions. The Federal Customs Service, which is responsible for officially fixing import and export in the country, says that in the first six months of 2015, 552 tons of sanctioned products were confiscated. In the first few months of 2015, authorities registered 700-800 violations of the food embargo, said Deputy Prime Minister Arkady Dvorkovich. 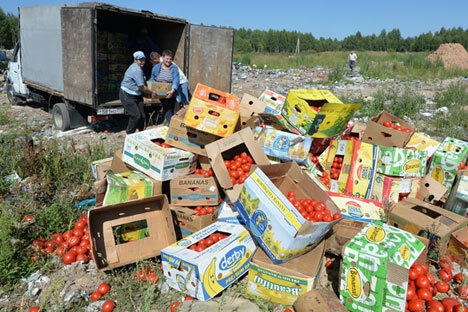 Russian authorities also removed 44.8 tons of banned goods from stores. And since Aug. 6, they have been destroying sanctioned products confiscated at the border.